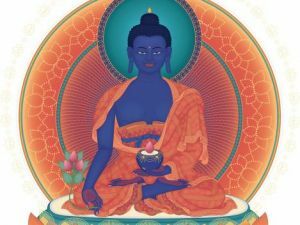 These detailed notes were taken during a seminar on the Medicine Buddha practice taught by Lama Sherab Dorje (Tulku Sherdor) to students in Ottawa, Canada in 1993. They cover every aspect of the sadhana arranged by the master Karma Chagmed from the Sky Treasures of Yonge Mingyur Dorje, including visualizations, symbolism, the mandala of the palace and deities, and so forth. To be used in conjunction with other teachings and transmissions on this sadhana, which is commonly practiced by both Kagyus and Nyingmas. Please send us a request by email for this instruction, using the ‘CONTACT US’ tab above, and we will reply in kind. You may also, of course, wish to make a donation by PayPal to help support our work. Thank you!